Twenty minutes to downtown Atlanta, 15 minutes to the airport, second lowest property taxes in the metro area. The question isn’t why is Douglas County booming, the question is, why hasn’t it been booming for decades? No one seems to have a better answer than the curse of being on the west side of a major city. But folks in Douglas County aren’t complaining. Instead, they’re taking advantage of their sudden popularity by recruiting high-tech, high-paying businesses and industry and developing mixed-use areas so that even a 20-minute commute doesn’t have to be endured. The county covers approximately 200 square miles west of Atlanta along Interstate 20. Lack of land hasn’t slowed commercial growth, however. “Our commercial and industrial tax base grew from 5 percent to 13 percent” in the last four years, says Tom Worthan, chairman of the Douglas County Board of Commissioners. Industrial development has centered along Thornton Road and Riverside Parkway in the southeastern part of the county. Thornton Road becomes Camp Creek Parkway, which leads directly to Hartsfield-Jackson Atlanta International Airport a few miles down the road. In the last five years, 15 new industrial buildings with 5 million square feet of industrial space housing 1,300 employees have sprung up around that busy intersection. Pepsico opened a new distribution center in the area in 2006, with more than 100 new jobs and $30 million in investment. But other businesses are joining retail with more traditional industry in this same area. “We’re seeing a blending of purely industrial district and retail or design,” Reynolds says. He cites as examples Mac Papers, which has a distribution center and a design center at the intersection; and Tropical Nut and Fruit, which has opened the Nut House retail outlet along with its distribution center. Even Atlanta-based law firm Alston and Bird is making the move west. It was scheduled to occupy a new records storage facility in WestPoint at Riverside business park (along that River-Thornton corridor) this spring. Other companies have found homes in business and industrial parks farther west along Interstate 20. Turano Baking Co., which provides baked goods to restaurants nationwide, just opened a 150,000-square-foot, $29 million facility employing 150 people in the Villa Rica Industrial Park. The family-owned, Chicago-based company needed a Southeast facility to serve customers from Texas to Florida, Reynolds says. The Terminus West Business Park, just off I-20, also has seen a lot of activity in the last couple of years. Staples opened a customer fulfillment center in 2006, with 200 new jobs and $32 million in investment. Exel Logistics recently opened a 585,500-square-foot facility to provide support for HON Co., which designs and manufactures office furniture in nearby Cedartown. The development authority has recruited all these new businesses, but then what? Then the Douglas County Chamber of Commerce takes over. “Once an industry lands here, the chamber of commerce is very supportive,” Reynolds says. The chamber sponsors a Business to Community Expo each spring where businesses set up booths in Arbor Place Mall on a Saturday to help make residents aware of local businesses. With 70 to 75 percent of people commuting outside the county for work each day, Boatright feels it’s important to get to residents when she can (on the weekends) to introduce them to the great things happening in their own backyards. The chamber has also introduced the Hispanic Persons Roundtable, working with the county’s growing Hispanic pop-ulation, and a Young Profes-sionals Group, which offers networking opportunities to people 24 to 36 years old. Representative of that economic diversity is Nioxin Research Labor-atories, which has been in Douglas County for years and is exactly the kind of company Reynolds likes to see thriving in the area. Family-owned Nioxin was started in Eva Graham’s bedroom in 1987. Now the company, which develops and markets products designed to improve the appearance of fine and thin-looking hair, is headquartered in a 200,000-square-foot building north of I-20 in Lithia Springs and sells products in salons in 42 countries, including recent additions mainland China and countries in Central and South America. “We do a lot of entertaining and training of our distributors,” Mark Graham, son of founder Eva Gra-ham and vice chairman of Nioxin, says of the company’s decision to grow in Douglas County. The proximity to the airport, the great manufacturing environment, the workforce and the availability of transportation were all listed as good reasons to stay put. Nioxin boasts nine out of the top 10 salon industry treatments and the number one product of its kind recommended by salon owners and stylists all over the world. But a worldwide reputation doesn’t mean the company has been forgotten at home. The county awarded Nioxin its 2004 Industry of the Year award. Conveniently located west of the industrial area at Thornton Road and Riverside Parkway is Tributary at New Manchester. Home of the 2007 Street of Dreams, Tributary abuts the Chattahoochee River and Sweetwater Creek State Park. The mixed-use community takes advantage of its site, with walking trails and parks throughout its 1,475 acres. Currently 300 families live in Tributary’s townhomes and detached single-family homes, with prices ranging from $200,000 to more than $2 million. At build out the development will include 2,500 to 3,000 homes, plus retail, office space and industry – including the new home of the Blood Services office of the Southern Region of the American Red Cross. And like everybody else, the county is coping with water issues. “We were one of the first counties to adopt conservation measures,” Worthan says. “We’re always looking for ways to expand our water supply.” Douglas is raising the Dog River Reservoir by 10 feet in order to gain more capacity. That project should be complete in a couple of years. Douglasville’s downtown area is taking off with restaurants and activities on the weekends. While Douglasville Mayor Mickey Thompson admits that “it’s always a struggle to rejuvenate a downtown area,” he points to the 97 percent occupancy rate in downtown buildings as evidence of success. One of the buildings finding a new purpose is City Hall itself, which was a movie theater in a former life. The huge old projector sitting in the lobby and the long steep stairs to the mayor’s office (which was once the projection booth) remind visitors of the building’s past life. Other rejuvenation is evident in the streets. Improvements, including brick pavers, new sidewalks and streetlights, are outward signs of the $3.2 million that has been spent in the past five years. The most recent improvement is a canopy to cover the stage at O’Neal Plaza, the downtown site of outdoor concerts and events. The downtown Fire Station No. 10 was recognized by the Georgia Department of Community Affairs as an Outstanding Design in New Construction project for its sensitivity to historic preservation. “The Sizemore Group has been commissioned to do a master plan for the downtown area,” Thompson says. The group has extensive experience in designing livable town centers. The plan will reach out 20 years into the future and is expected to be rolled out within the next few months. Out by the interstate, but still within the city limits, West Pines Golf Club has been purchased by the city. “Lots of companies were poised to develop it,” Thompson says. The city felt it was important to keep the 166 acres as greenspace, but it had to earn its keep, so as not to cost the city money. A special purpose local option sales tax (SPLOST) provided funds for the purchase. The course was redesigned and is “now a great, economical place to play golf,” Thompson says. Golf isn’t the only thing people in Douglas County can do for fun. The award-winning Cultural Arts Council of Douglasville/Douglas County provides more than just Mad Hatter Tea Parties and cowboy poetry. 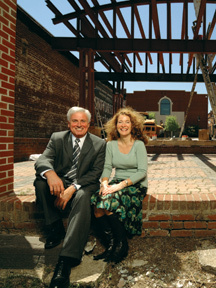 With a $1.1 million economic impact on the region, the organization hosts chamber music concerts in its home – a beautifully restored 1901 neoclassical former residence – concerts at O’Neal Plaza in downtown Douglasville, art exhibits, both professional and student, and artists-in residence programs for the schools. “We are the sole professional provider of arts activities here,” says Laura Lieberman, executive director. The council is outgrowing its 4,000-square-foot home, but has created a campus expansion plan that would add 14,000 square feet, while taking care of the house, Lieberman says. Now, they just need the funds, $5 million of them, to build the facility they dream of. The new facility would add a studio/classroom wing, a gallery, music practice rooms and a small theater. It would spread out behind and beside the house, leaving it intact. A recent SPLOST that would have helped raise funds for the expansion didn’t go through, so the council is looking at scaling back the plans without losing program facilities. The county also recognizes that providing recreation for the community is an important function and has developed a comprehensive park plan, which spells out needed improvements to existing parks and where and when new parks will be warranted. “We continue to build parks for children,” Worthan says. “We have lots of natural beauty. The 800 acres of Dog River Park are more like the north Georgia mountains.” In addition, a new trailhead just opened along the Chattahoochee at the 500-acre Boundary Waters Park in the southeast part of the county. The county has more than just pockets of natural beauty. “We’re trying to preserve the rural atmosphere and preserve water quality” in the western third of the county, south of Interstate 20, Worthan says. They’ve done this by imposing a three-acre minimum on residential development. In addition, they are seeking Scenic Byway status for Highway 166, which crosses the reservoir and follows the river.